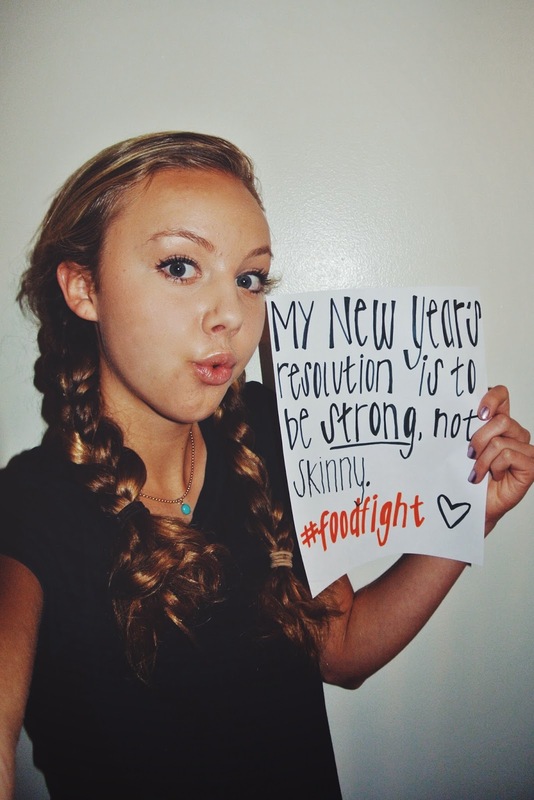 Join me in raising awareness for eating disorders by posting a picture of your New Year's resolution aimed at loving your body how it is, instead of trying to change it. Use the hashtag #foodfight. Food is not meant to be a demon. It is meant to nurture, to be an art, to add vibrancy to life, to taste good! Yet for so many girls food is a demon. For so many of my cherished friends, so many of the girls that pop up on my Instagram feed, that are on my sports teams, that are at my play rehearsals, that surround me in the library, food is a twisted monster strangling souls, minds, and bodies. Last New Year's I made a resolution to start eating more fruits and vegetables. To work out more. To get fit. I pinned a thousand health recipes and started running four miles everyday, even after sports practices and games. I packed skimpy salads for lunch and wrote insanely detailed grocery lists for my mom. I was rarely full and always thinking about food. At the time, I told myself I was doing it all to be "healthy." In retrospect I realize I wasn't doing it to be healthy, but rather to be the best at something. To be the skinniest. I am an insanely competitive person, especially with myself, and that competitiveness ignited my struggle with food. After a month or so my parents noticed that my "health kick" was becoming a dangerous obsession. They tried talking to me but I brushed off their words. "Guys, just because I'm not eating ice cream every night doesn't mean I'm anorexic," I'd scoff. I never skipped a meal, I never forced myself to throw up, and because I never did these things I thought there was no way I could have an eating disorder. I was wrong. I was always planning my next snack, obsessively asking my mother what we were having for dinner, demanding that I go with my parents to the grocery store. My doctor finally disillusioned me at my annual check-up. She suggested I see a nutritionist and cool it on my daily runs. After talking to Barrett Butler, a fantastic nutritionist and good friend of my mom's, things looked up. Still, it took several months to get back on track. Ultimately, though, I realized that not eating cookies at lunch is the unhealthy thing to do. I mean, for goodness sakes people, I'm fifteen--if there's a time to eat cookies the time is now!!!! Every girl fights with food for a different reason. Some girls do it because they feel pressure from relationships, others because they need to control something and they feel weight is something they can control easily, and some because of home environments. The origin of all our struggles with food, though, is the ridiculous pressure to achieve this contorted definition of the "beautiful woman" that society has sculpted. We all feel the pressure. We see it when we look at our Instagram feeds, when we turn on the television, when we when we open a magazine. We see it in each other. To achieve it we do sick things like altering our photographs to make us look thinner or sneak our mother's diet pills or shove our fingers down our throats in the bathroom after lunch. Eating disorders are a product of a society that expects women to be a fake, unattainable type of beautiful. A type of beautiful that requires mental and physical pain. A type of beautiful that leaves you scarred on the inside. As women we buy into this expectation, it is almost inevitable that we do. Ridiculous expectations are what make us fight these seemingly unconquerable battles with food demons and ourselves. Admitting to an eating disorder is admitting to imperfection, which is completely counterintuitive to a girl who is sacrificing her mental and physical wellbeing to attain society's standard of beauty. Thus telling people, especially yourself, about your problem is unthinkably daunting. The only way to win the fight with food, though, is to admit your problem first to yourself, and then to others. It takes bravery, strength, a good friend, and sometimes a whole lotta tears. The thing about eating disorders, though, is that you are the only one who can save you, as cheesy as it sounds. If you are struggling with food tell someone. Don't let something as simple as food dictate how you see yourself. Don't let food be your downfall. This New Year's let's screw the "hit-the-gym" resolutions and instead aim to maintain an actually healthy relationship with food and love our bodies for what they are. Let's resolve to eat Oreos with lunch, to take a nap instead of going for a run, to stop criticizing others' bodies, to refuse to let food dominate our minds and lives, to refuse to let society manipulate how we see ourselves! If you don't struggle with food, make a resolution to help the girls around you and to maintain a healthy mindset. 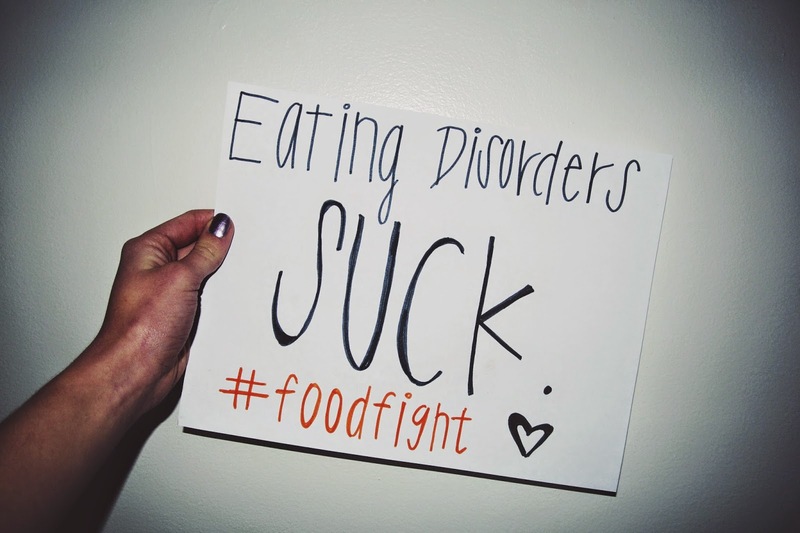 Eating disorders are everywhere. 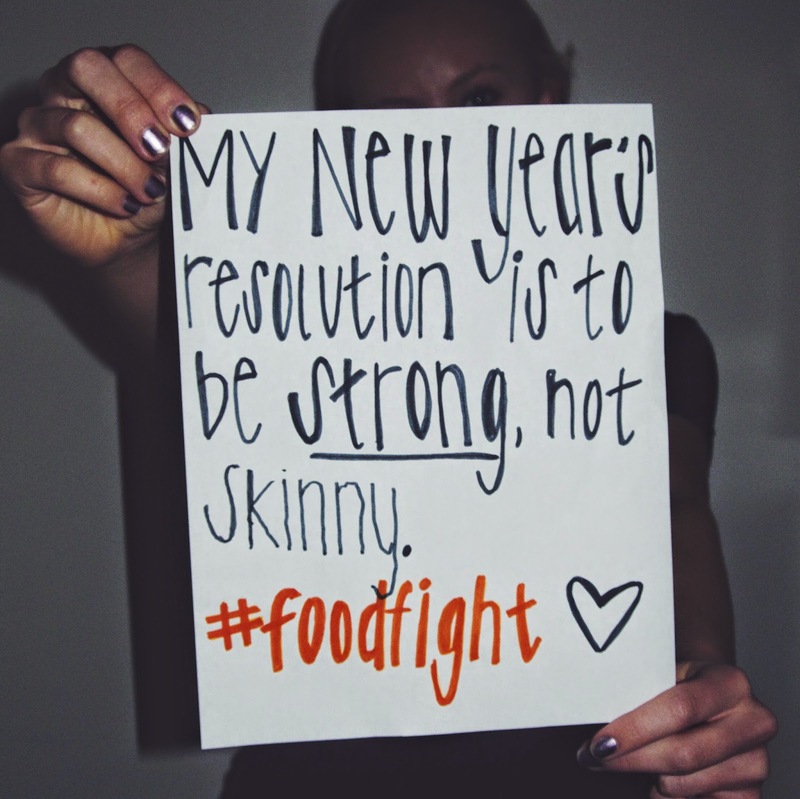 Help raise awareness by posting a photo of your New Year's resolution to end fights with food and use the hashtag #foodfight. Below I've included a list of nutritionist Barrett Butler's tips to get back on track when eating becomes confusing. I've also included words from some of the strongest gals I know who have fought, and are fighting with food. Each of your meals and snacks should include a healthy fat (mayonnaise, peanut butter, nuts, avocado), a protein, and a carbohydrate (fruits and vegetables are carbohydrates). Maintain a stable blood sugar level throughout the day. This means that you eat something truly substantial when you feel hungry. Eat breakfast, lunch, a snack between lunch and dinner, dinner, and whenever else you feel hungry. Maintaining a stable blood sugar throughout the day will prevent binge eating. It's okay to eat when you're bored. It's okay to eat when you're sad. It's okay to eat when you're happy. It's okay to eat when you're not hungry. For the remaining two weeks of winter break I intend to smother myself in fuzzy blankets, stick to a strict Danish Kringle/donut diet, stay in bed, and watch charming, old movies. The only thing that could possibly put a damper on my winter-cozy-cheery-lovely-sweetsmelling-bliss is my mother telling me to get out of bed (Mom!!! can't you see i'm busy!?!?!?) and the unthinkable stress of actually choosing the movies I watch. Lucky for both me and you, we got Mebane Garner, old movie obsessor/expert/extraordinaire. Meeerb!!!! Come to our rescue!!! Give us a list of movies to watch so we don't have to pick them out ourselves!!!! ("Okay Master Ryan, whatever you say") Hehehehe. Check out Mebane's list of the loveliest old movies to curl up and watch with some Kringle and cocoa. Oh! I almost forgot. To evade dreaded chores or even getting out of bed, ask your mom to watch the old movies with you! Wintery cuddle sessions with loved ones, old movies, and Kringle are what it's aaaaall about. PALS! Boy do I have good news for you. 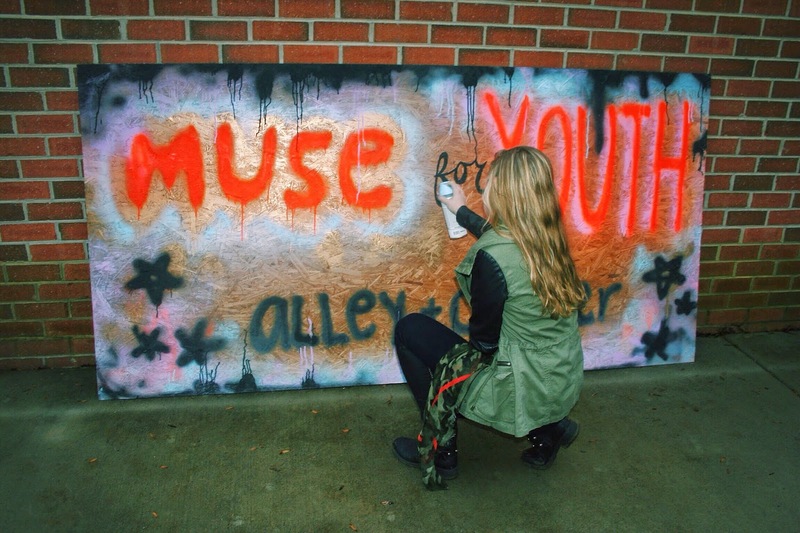 Two of my über-talented artist frands, Collier and Alley, are kicking off their own column on YOUTH. They call it "Muse." 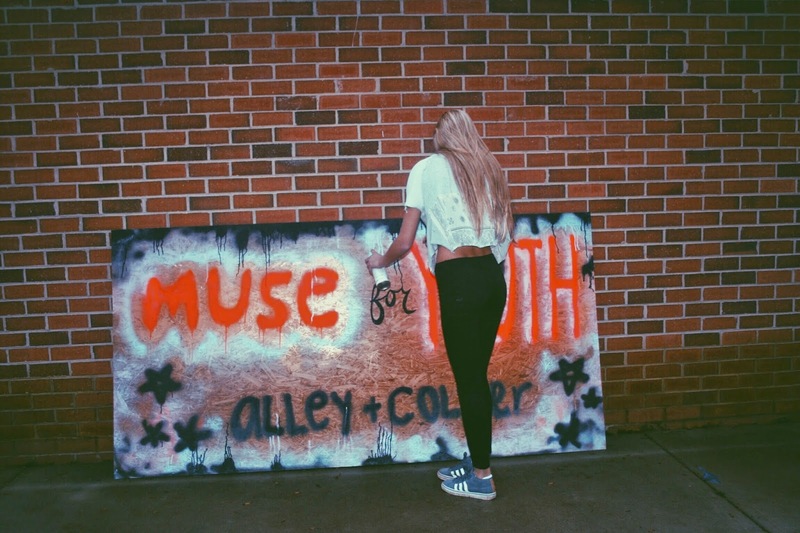 Muse is a space for you guys (youthlings) to share all your rad artwork with us and the rest of the world wide web. 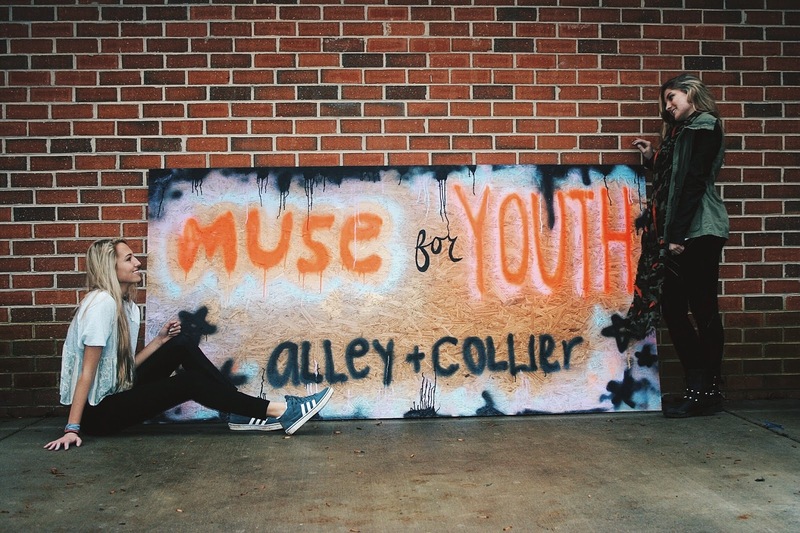 Alley and Collier are collecting submissions of artwork right now via email (alleyandcollieryouth@gmail.com) and Instagram (#museforyouth). If you have a doodle, a sculpture, a sketch, a painting, or anything else that you created and are proud of, just snap a pic of your work and email it to Alley and Collier or use their hashtag. About every two weeks A & C will go through the submissions and post a couple of their favorite pieces on Muse. The gals will also post pictures of their own art to share personal struggles, techniques, inspiration, and vibes. Waaaahooooo! Let the musin' begin. For the entirety of my love affair with the glorious art of clothing, which is to say most of my life, I've examined the difference between fashion and style. Magazines, Instagram posts, my grandmother, models, sales ladies, amigas and more have beaten the concept that fashion is broad-reaching, impersonal, and seasonal and style is individualistic and timeless into my head. Style, they say, is a form of self expression, thus unique to every gal/guy/earthling because, well, every guy/gal/earthling is unique. Brief interlude: hoorah for uniqueness. Uniqueness is the stuff. Outerlude: I totally agree with this. Style is, indeed, unique to every human. But the misconception that all-too-often accompanies the idea of style being unique is style being consistent. Like, if you wear a grungy t-shirt and faded black jeans one day you can't wear a girly-fru-fru dress the next and claim you have a defined style. Well, I OBJECT. I espesh object if you're in high school. High school, my friends, is all about discovering who you are and who you want to be. Wait… do I sound like a middle-aged guidance counselor? Ew. But seriously. A young person's style should not be consistent. Teenagers have a colorful array of personalities, of parts, of feelings, of pieces. We have parts that are ambitious and focused, parts that are crafty, parts that are outspoken, parts that are phunkyphresh, parts that feel like gardening, parts that love intellectual conversations with dads, parts that hate gardening, parts that just wanna cry, parts that like being alone, parts that are ready to party (raise the roof, raise the roof), the list goes on! In fact, we have so many parts that some of them are not even officially our own parts, but rather parts we try on for a day to see whether we like them or not--to see whether they fit. I mean, that's what being in high school is all about, amiright? 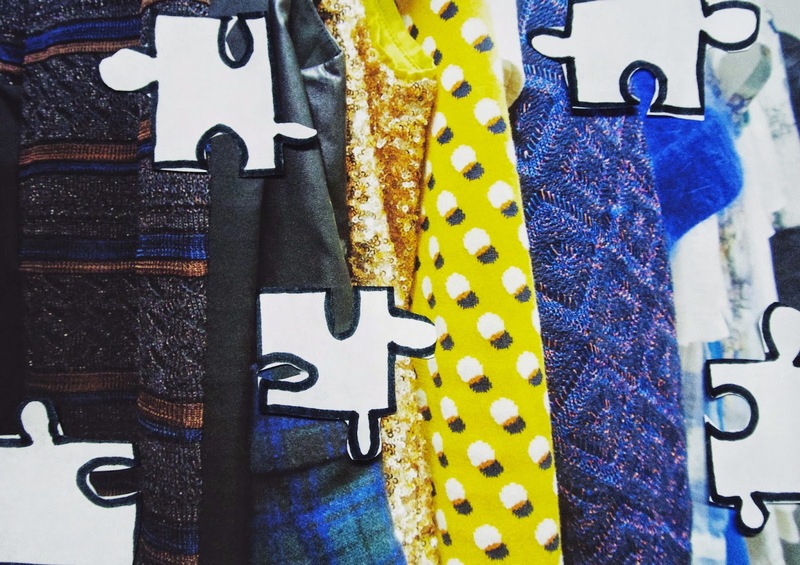 Trying on parts and discovering which dazzling pieces fit into the grand puzzle of you. In trying on all these parts one becomes a wildly inconsistent being, surprising everyone, but mostly her parents, with what persona or attitude she'll be sporting that day. This puzzle-making process can be, well, puzzling at times, but mostly it's fun and exciting and dangerous in a scrumptious kinda way. In fact, trying on all these potential-parts-o-you via clothes is the most scrumptious part of the whole shebang. My outfits change drastically day-to-day. My wardrobe is wildly inconsistent. I'm grungy and tired one day and spunky and up-beat the next and my clothing communicates this. Of course, there are common threads (pun intended… wow do I kill the pun game or what) that run throughout my wardrobe, just like there are common threads of me that are stitched into each of my attitudes. My inconsistent style reflects my inconsistent self and for this I love the art of clothing. Oooolala! 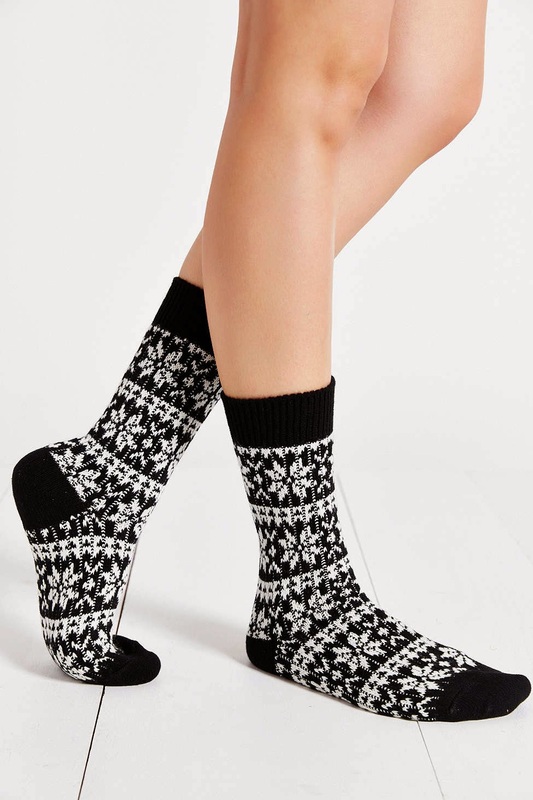 These ones from Urban are the cutest. Wear them with funky clogs! These beauts from Shopbop are über-cool and so breathable!Wear them with futuristic sandals. More phunkyphresh American Apparel awesomeness. These are the cutest. 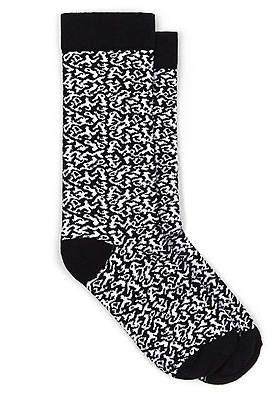 Frilly white socks from Urban. Pair them with tough Oxfords, gal! These ones from Urban would be PERFECT with Birkenstocks. So quirky-comfy-chic. 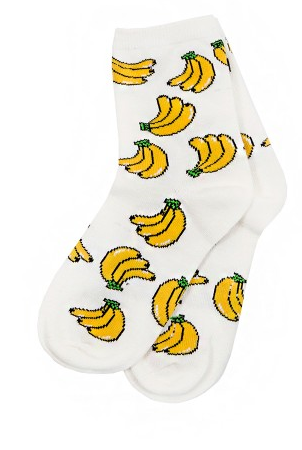 I'm going bananas over these babies. I'd wear them with chunky, black mandals. 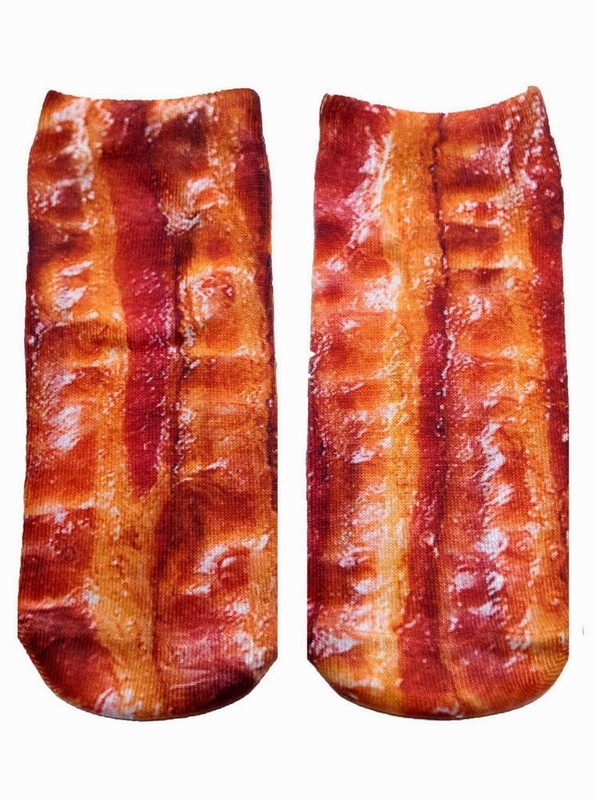 Bacon socks from Nylon. These speak for themselves. Wear them with absolutely nothing else. 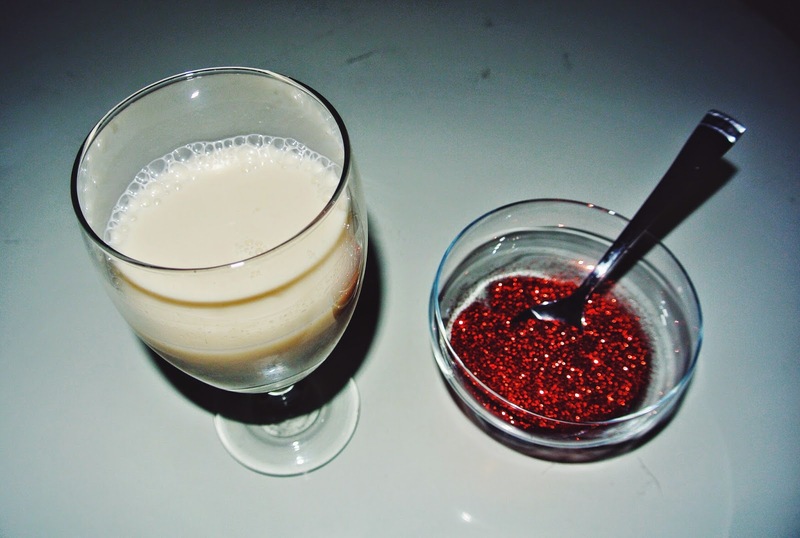 Glitter is inedible. It's heart-wrenching, I know, but also a fact of life. Can you digest (lol pun intended) this harsh reality so that we may proceed? Yes? Excellent. Now that we've gotten that out of the way, you're probably wondering what this post is actually about since I obviously lied to you in the title. Sry about that. ANYWAYS, what this post is really about, doll, is homemade granola--and not just any homemade granola. Foodgasmic granola. Fantastic granola. All around dandy granola. If glitter weren't shiny flecks of metal and plastic, I imagine it would taste like this granola. It's that magical. So let's get down to business, pals. Heat oven to 250 degrees fahrenheit. Combine oats and nuts and seeds. Place mixture on baking sheet. Toast in oven at 250 for fifteen minutes. Stir occasionally. After fifteen minutes, take out of oven and add canola oil, sweetness, and molasses. Back in oven for fifteen minutes, stirring often. Remove from oven, throw the whole thing into a bowl/container/woven basket/mug/bucket/whatever and stir in the coconut, dried fruit, salt, and spices. P.S. this deeeelish treat makes a great holiday gift for teachers/pals/coaches/lunch ladies/theater directors/anyone you love! Spread the magic. Don't get me wrong, I love high-qual music. The Black Keys, Portugal. The Man, the Kooks, Chance the Rapper, a lil' Tom Petty-- all those guys do me right. But you know what else does me right? 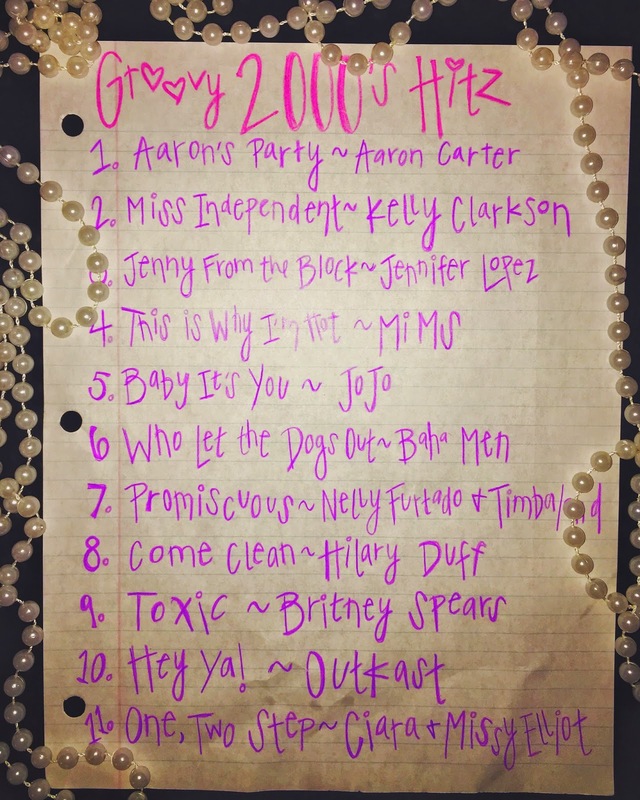 Cheesy 2000's pop hits. I mean, c'mon people, nothing lifts the spirits like bustin' a couple of funkyfresh moves to Hilary Duff's Come Clean album. Somewhere deep inside all of us a tiny, pretween person, adorned in bedazzled jeans and a Gap belly shirt, is thirsting for AM 1480 circa 2004. That's Disney Channel AM to all you sorry excuses for nineties children. Throw back this Thursday. Give into the bedazzled-booty kiddo subsiding in your soul and bust a move. YOUTH by ryan. Ryan Benson. 2015. Powered by Blogger.